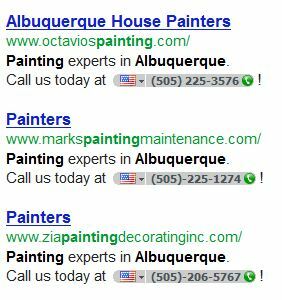 Sure seem to be a lot of “painting experts” in Albuquerque…which one would click on?! All 3 of these companies have their AdWords campaigns and websites managed by the same big online Yellow Pages type firm that “specializes” in local business marketing. Clearly this firm just inserted their standard “house painter” ad copy into each campaign, added a phone number and website URL and they were done. Your AdWords copy is your chance to stand out from the competition. Let people know what makes your business unique. Show them that you’re the company that’s best suited to address their needs/problems. If your ad is virtually identical to the other ads running next to them, you have no chance of doing any of those things. These business owners (who I can only assume haven’t checked out their ads) are missing out on a lot of leads to other AdWords advertisers who have ads that say something unique and compelling. The real shame is that, after trying this for a while, the owners of these businesses are going to stop using AdWords because they think it doesn’t work. But chances are good that it would work quite well if they had a properly managed campaign. If you’re running an AdWords campaign managed by another company (especially a big, national firm), take some time to do some searches on keywords your ads should pop up for. Make sure your ads are popping up. Make sure they’re not the same as the other ads their competing against. And make sure the ad copy contains a benefit, offer, and/or call to action that gives people a reason to click on your ad instead of your competitors’ ads! When managing AdWords campaigns, we spend a lot of time digging into a business to find the unique qualities that will make it stand out…even if we have to drag it out of the business owner! Whether you’re managing your own campaign or have another company managing it, do your reflect what truly makes you unique?